This machine adopts semi-hot air circulation heating method, which can be continuously baked. It does not need to stop loading and unloading in the middle, suitable for medium and large coffee baking factories. 2.The computer automatically controls the temperature, firepower, exhaust size, baking time, and the customer can also set according to their own needs. 5. Imported frequency conversion controller can control the size of the exhaust of the fan to make the exhaust gas stable and convenient. 6.The suction machine is unique in design, which can adjust the suction height according to the actual material. The suction is smooth and the speed is fast, so it does not hurt the original beans. 9.The coffee beans are baked evenly, and the residue can be completely separated without odor. 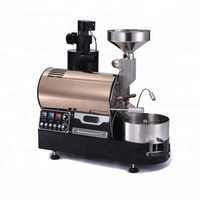 10.It is equipped with automatic coffee machine to remove stone, effectively remove stones and other magazines, improve the quality of roasted beans, large-capacity stainless steel sealed cans with the function of waking beans, can effectively connect coffee grinders and packaging machines and other equipment to improve efficiency. Delivery:New conditions machines will be delivered within 15-45 days after we have received deposit. JINGXIN company(HONGXIN machinery factory) is a professional manufacturer of agricultural and food process machinery.We are located in Zhengzhou city.We manufacture and sell machines to our clients over 10 years.We are gold supplier on Alibaba for more than 7 year,every clients will get full protection for orders with our free Trade Assurance.Our factory will welcome you to visit us if you have interest of our machines.You can also send us emails or contact us online to share your ideas,advice of our machines,it will be much appreciated.